Oatmeal is not only a world-renowned symbol of the pure English Breakfast, but also very practical invention of mankind. 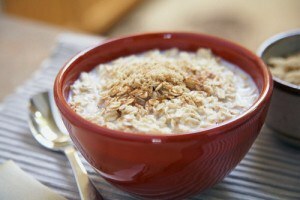 Oatmeal, cooked in water, has healing properties and will fill you with energy for a good half of the day. In addition, it prepares quickly. And according to scientists, is a natural antidepressant. But how to do it delicious? As mentioned the most famous Englishman: "Elementary!" refined olive oil — 1/2 teaspoon. Traditionally, porridge boiled in milk. However, this is optional. Delicious oatmeal can be cooked and on the water. Bring water to a boil, add salt and sugar. Raisins wash, remove stalks, put in tea Cup and pour boiling water. In boiling water put the oatmeal and simmer until cooked (5-10 minutes, depending on the cereal). Porridge is easier to cook in a pot or saucepan with non-stick coating and thick bottom. Porridge will not burn, and the dishes can be washed effortlessly. Add butter, cover tightly and let sit for another couple of minutes. During this time, you can prepare sweet toppings for porridge. Apple peel and grate on a coarse grater or finely chop. Drain the water from the raisins. Mix the grated Apple, raisins and cinnamon. Put cereal in a bowl and top with spread Apple-raisin stuffing. If you want to save time spent on preparing the morning's Breakfast, no need to cook porridge in the evening and pre-cook the fruit Supplement: oatmeal warmed loses all its charm, the raisins will be too steamed, and the Apple will oxidize and darken. But there is a small trick. Oatmeal can be cooked in a thermos and just pour half a Cup of cereal Cup of boiling water and leave overnight to uprivate. Salt and sugar add just before serving. Apples also can be ground in advance, but be sure to mix them with a little lemon juice, it will slow down the development of oxidative reactions. The apples will retain their original color. This option is suitable for vegetarians or people with allergies to milk protein contained in cow's milk and butter. It is not necessary to pour water, which was raisins. The so-called raisin water contains many useful trace elements necessary to maintain the water-salt balance in the human body. This is especially true on hot days when many are suffering from dehydration. For those who prefer a savoury porridge is a fruity sweet filling, you can add pieces of cheese or fried bacon. In this case, add sugar not worth it.